Located at Yerwada in Pune, Exotica is true to its name. It is exotic in its ambiance, with a roof top restaurant that gives a picturesque view of the surroundings. This open air restaurant is swanky and very much urban and classy in its decor. The menu has variety of dishes which serve Indian, and Continental. With a lounge bar attached to the restaurant, there are plenty of cocktails, and mocktails to choose from. 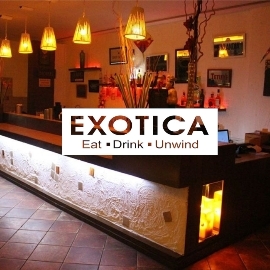 It is a group-friendly restaurant and if you are looking for a day out with friends for lunch or dinner with a relaxed and laid back atmosphere then Exotica is the perfect place to unwind over lunch with the advantage of a roof top restaurant and lounge area for an enjoyable evening.